NOLF Webster AICUZ Study Addendum. Source: NAVFAC. HOLLYWOOD, Md. (Sept. 27, 2018)—The U.S. Navy has increased the size of accident potential zones (APZ) around its testing field in St. Inigoes at Webster Field after the proliferation of its mission to test unmanned aircraft (UAS) there. The installation of a new APZ stemming from the four take-off points of the two runways at Webster Field could mean greater military testing activity at the expense of county development and growth. Developments such as new homes or commercial ventures can be curtailed or disallowed entirely in an APZ for fear civilians might be hurt from an aircraft mishap. In a letter to the Commissioners of St. Mary's County, Capt. Jason Hammond, commanding officer at Patuxent River Naval Air Station, asked them to incorporate the latest addition to the air installation compatible use zone (AICUZ) into their plans. "This AICUZ study addendum was prepared to aid in preserving the military's operational capabilities at …Webster [Field] and protect the health, safety and welfare of the public by establishing Accident Potential Zone II in the vicinity of the airfield," Hammond wrote. "This is another step in our continued joint efforts to make St. Mary's County the premier and safe place to live." The new APZ significantly increases the area of operations at Webster Field in the areas of Priest Point and Rosecroft as well as Fort Point in the St. Mary's River. The new zone also extends out into Smith Creek farther south and out further into St. Inigoes to the east. 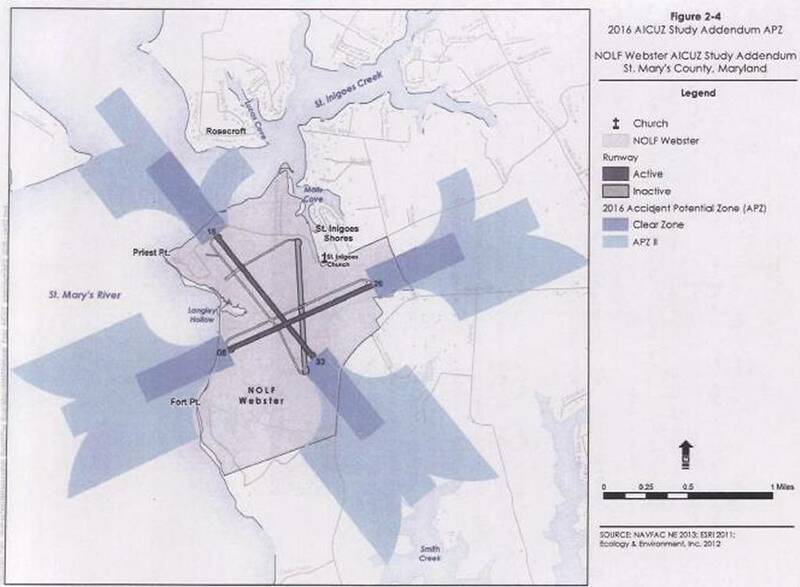 The Navy's addendum to the current AICUZ for Webster Field, initiated in 2016, show there are a few homes in the new APZ which are incompatible with the mission at the air field, but most of the land is compatible as it is of a rural nature. However, the Navy also noted that the county's zoning still allows for some residential development in the new APZ.